The video shows the documentary footage of Walk for Life, a silent protest walk project led by Japanese monks from Nepal. The walk started in March 2014 and continues for five months, covering about 1,100 km, and ending in Hiroshima Memorial Park. The walk follows the route of the shoreline struck by the tsunami back in 2011, and revisits various nuclear power plant	s, while praying for world peace and apologizing to the sea at certain points. Walk for Life from Hanae Utamura on Vimeo. 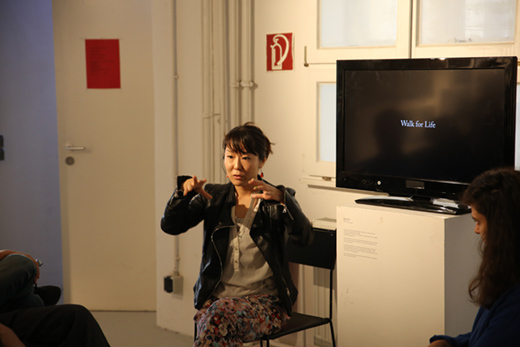 In addition, a conversation is held between Hanae Utamura and Marwa Arsanios, focusing on the topic of catastrophe and “meltdown” – a state where civilization melts into nature but also meaning the melting infrastructure of life. The walk is seen as a way to add gravity to or “ground” life.